I heard a rumor recently and it blew my mind. No, I'm not talking about Lady Gaga in space. (Although that's a good one.) It's food related dish. And it’s juicy. Quite literally. Three words. One incredible concept. Seedless. Concord. Grapes. You can imagine my delight knowing that seedless grapes were out there. I had to find some. But they’ve been mysteriously absent at every grocery store I’ve visited over the last two weeks. I brought the topic up at a dinner with some food editor friends and they had never heard of such a thing. I was starting to think that seedless concord grapes were an urban legend. The alligators in the sewers have probably eaten all the seedless concord grapes. So this weekend, I got up early and trekked over to the Union Square famers’ market. Early is a relative term…but still, I felt like a real explorer, braving the elements (it was supposed to drizzle), and setting out to find an elusive beast that may or may not even exist. I was on a mission to find the Bigfoot of the farmers' market. I arrived at the bustling square brimming with hope and excitement. The apples were overflowing. Pears galore. Cheeses, meats, bread, pickles, and pretzels were laid out right where they were supposed to be. Grapes too. Gorgeous piles of dusty purple bunches were everywhere, shining in the sun and taunting me. No sign of the seedless variety. My inquiries were mostly met with scorn. I bet farmers probably love their crops like children. Essentially I was criticizing their kids for superfluous seeds and I could tell what they were thinking... "Keep on moving you lazy grape eater. You're not worthy of my fruit." Eventually I found one nice vendor who laughed at me, popped a grape in his mouth and said, “Oh yeah. Sure. Seedless. Every once in while you might get a seedless one.” Then he spit out some seeds. I caved. That last man was so nice, I bought a couple of pints of his seedy bunches without too much hesitation. I guess I’m not so much of a hunter after all. Truth is, I gave up quickly. The nice man let me munch on a couple grapes before I bought them and with just those little bites, all juicy and concentrated grape-sweet splendor, I was transported directly to fruit nirvana. I think it was an edible ephiphany. The concords were perfect just the way that they were. I had found what I was looking for right in front of my face and I didn't need anything else. You can't always get what you want. But sometimes you get what you need. I rushed home and got right to my baking project. Scones. A long time ago, someone wanted to eat cake and call it breakfast. That person created the very first scone. I love a good scone. All that crunchy, sugary crust with a warm, tender middle, infused with serious fruit flavor. I sliced and seeded the grapes before adding them to my dough. That may take an extra 10 minutes but the concords will reward you for your hard work. While baking away in their cozy oven home, the grapes nestle into the dough, juice out, cook down, and get all condensed and jammy. No additional jelly required. I opted for a generous swipe of mascarpone instead. Heck, with all that extra work removing seeds I earned it, right? Maybe I'll take two swipes. You should too. We deserve it. 1. Preheat oven to 425°F. In a liquid measuring cup, whisk together cream, egg, and egg yolk. In a large bowl, combine flour, granulated sugar, baking powder, lemon zest, and salt. Cut in butter with a pastry blender until you have a mixture that resembles coarse meal with some butter pieces the size of peas. Pop this mixture in the freezer while you remove the seeds from the grapes. 2. Using a sharp paring knife, cut each grape in half. Then, using the tip of the knife, push out the seeds from each half. Try to keep the grape center safely tucked in the skin, but don't worry too much if it pops out. 3. Using a fork, lightly stir cream mixture into flour mixture just until it comes together. Don’t get carried away – you want it to be shaggy with bits of dry flour. 2. Turn the mixture out onto a lightly floured surface. Using your hands, knead it once, maybe twice – just enough to get it together. 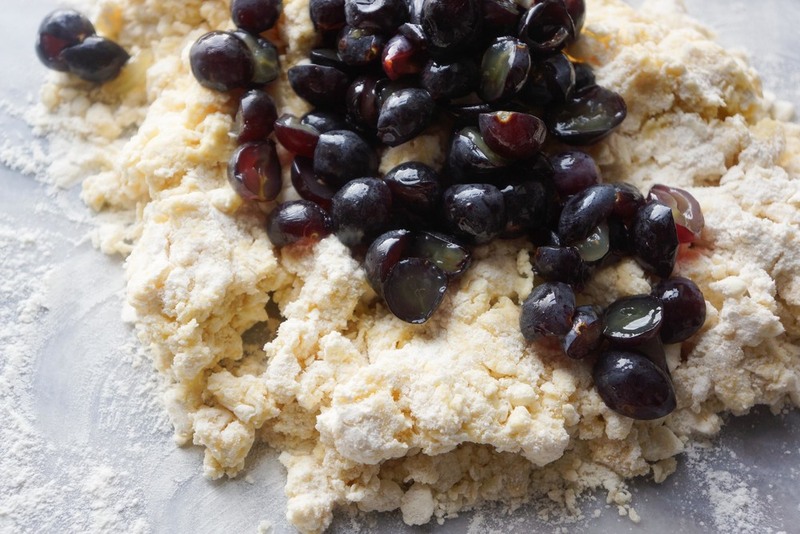 Top with grapes and gently fold the dough a few times to incorporate them. Try not to work quickly without squishing the grapes or your dough will become too wet. Shape dough into a 10-inch-by-5-inch rectangle. Cut the rectangle into 8 squares. (At this point you could freeze the scones for a few days, or even weeks, and then bake them off frozen whenever you need a treat.) Transfer scones to a parchment-lined baking sheet. Brush with cream and sprinkle with sanding sugar. Bake until set and golden brown, 18 to 22 minutes . Serve warm with a generous swipe of mascarpone if you dare.